We're so close to Sea World, if you listen closely you may hear the seals barking & we have a free shuttle. 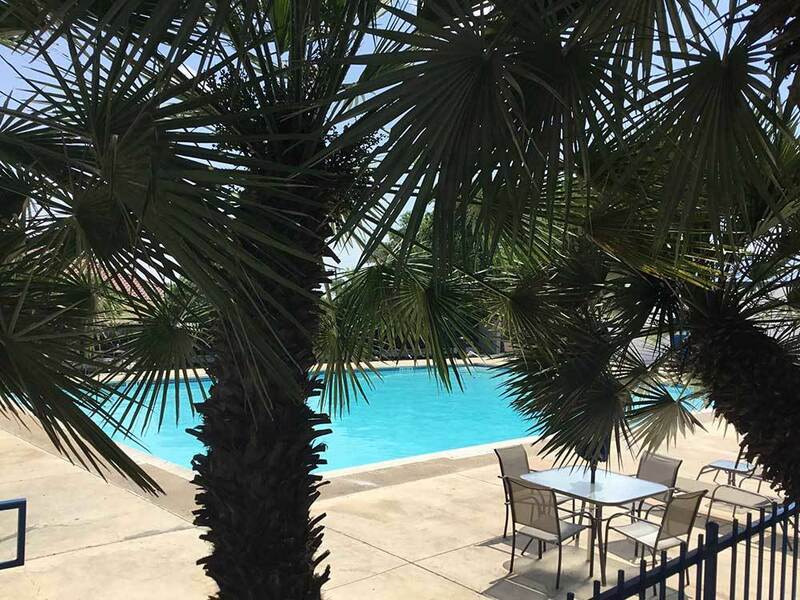 After visiting Six Flags Fiesta TX, the River Walk, and the Alamo, come home to relax in the shade or by the pool. Terrible property manager. When setting up after dark I was bitten numerous times by fire ants at the utility pole and through out the entire pull through site. In addition, I tracked dog poop all through my RV that was not cleaned up in the site. I left a message for property manager the next morning, again that afternoon and then a again the next day. She refused to return my calls (even though she was on the property and I had confirmed that she was given my message all 3 times). Upon check out I asked to speak to the property manager and was told that she was unavailable to discuss the matter. She finally called me three days after the incident and preceded to blame everyone / everything else. When I asked her to comp one of the three nights, she refused. She further encouraged me to post my negative experience on social media and stated that the owners let her make all decisions. I would suggest that the owners provide the property manager with management and customers service 101 training. This is a good place to stay. I wouldn't classify it as a resort but a good average RV Park. The staff was very friendly. The spaces are concrete pads and pretty level. The park seemed to be pretty clean. Although there seemed to be several "long stayers" who seemed to live there in their campers/RV's. It is close to Sea World. The wifi is only free for first 24 hrs. Then you have to pay - not sure why. There is also no refund if you need to leave early. This is stated in their policy but just know that up front. The managers are never available to talk when you have an issue. The staff member they hired to be “fulltime” security is a joke. He is super aggressive and overly assertive with campers. If you try to discuss with managers they ask you to leave the park. I have been here several times and have NEVER seen it this bad. Previous manager had her vices. I would take her any day over these two new people. The grounds are falling apart. The laundry room is filthy. The bathrooms - I won’t use they are nasty. Grounds are not kept up. It’s a shame. Has so much potential. We have stayed at this RV Resort many times from 2004, first with our kids and now grand kids. We have NEVER encountered any problems or rude staff. The bathrooms are clean and cleaned often. We have always been asked if everything is OK and have enjoyed our stay. We buy season passes to Sea World but often go downtown as well. We have stayed there in July, September and will be going back in October and December.. Can't understand the negative review. Our thanks to all the friendly staff! As our second RV experience, the Admiralty was very good experience. The personnel were all cheerful and helpful, the RV store had reasonable prices and all the sites were clean left room for slide-outs and had small patios right next to the concrete pads. Levelling was no problem at all and the hook-ups were easily accessible. While we didn't use the shuttle to Sea World, the RV office/store had loads of tourist material and local bus schedules. Restrooms and showers were clean and Cool. Laundry facilities were great too. Being in the foothills, reception for radio and TV was great just using our RV antenna netted about sixty channels, even though cable hook-ups were available. Access into San Antonio, makes Google Maps or GPS a must. Public parking is ample, but expensive and we opted for on/off Trolley service to hit all the tourist spots. As we were leaving, a gentleman who introduced himself as the owner, asked us about our stay and actually asked us what improvements and changes we would suggest. Overall, we were thoroughly impressed and the staff added to our positive experience. The Admiralty's distance from the city was both the plus and the minus of it's location. The drive into San Antonio downtown can be a challenge to RVers used to rural locations. Ultimately, the bottom line is we would enjoy going back there anytime and would definitely recommend this RV park/resort to anyone visiting the San Antonio area. Nice RV park. Sites are pretty close but otherwise we enjoyed our stay. Would stay here again. Staff was great we were running late , staff said just set up any problems call and they would come to help. Very clean. One thing is shower room not much pressure but clean. Grandkids loved the heated pool. nice clean laundry room. Staff was friendly and helpful would come back again. Very friendly staff, well maintained facilities, great place to stay. I'm a full timer and love staying here. Rates are first class. Stayed for a week. Had problems with air conditioner. The girls at front desk gave me a air conditioner mans number. Had to have a new air conditioner installed very happy with A-1 services . I would like to thank the ladies at the front desk and the other worker for all your help and kindness . I'll be back . In a word HORRIBLE!!! I made reservations a couple months in advance for a rv spot and a cabin. Well they put me in the wrong type of rv spot (I requested for the super premium) or whatever it's called and I was put in a shade spot. When I brought it to the staffs attention I was told well you didn't pay for it. My response ok I'll pay for it and move to a better spot, was told no that's not how it works..... then the manager decides to verbally attack me using foul language. On top of this the cabin that we rented had a problem with the ac and the manager who btw claims to be the owner decided to let himself in and out of the cabin any time he wanted.... not cool at all. I asked for a refund for these reasons and the foul language started again. We packed up and left. After reading other reviews on other sites this appears to be the norm. How is this place a good sam location I'll never know. Do yourself a favor and book somewhere else where they actually value their customers.